Many of you have asked us if we make sheet cakes. To be honest, it's not our specialty. We're much better at creating small, simple cakes for intimate events. Here's a photo of one we made for a wedding this past summer. It's a lemon cake with butter cream frosting. All of the flowers are fresh, and edible. Weekend off - part two. For the first time in weeks, we had an entire weekend off. Well, almost. Dina had back-to-back gigs in Rehoboh, DE, so technically, one of was working. The forecast for the weekend was promising spring-like temps and clear skies, so we decided to camp at Cape Henlopen State Park, just north of Rehoboth. We arrived on Friday night, chose one of the tent sites - away from the RVs, and close to the dunes. It was the beach, and it was beautiful. We were so excited for the warm weather, and couldn't wait for Saturday to park our chairs on the beach. Well, that did not happen! 3. Chop up half of a sweet onion and add to the sizzling butter. 4. Once the onions start to get soft, add potatoes. To make it easy, we always pre-cook the potatoes at home. 5. As the bacon starts to get crisp, remove it from the skillet and keep it warm. We just put it in an empty pan near the fire. 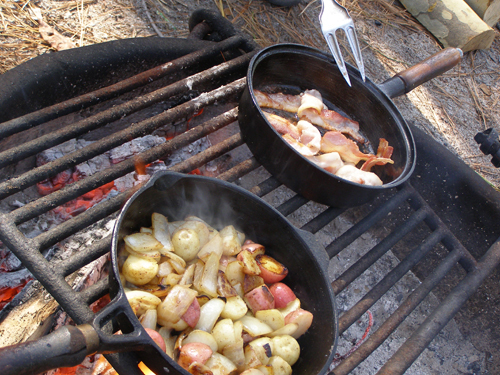 Dump the bacon grease into the fire, add water to the hot skillet and scrape it clean with a metal spatula. Put the skillet back on the cooking grate to get hot again. 6. We have a set of nesting camping pots, and use the smallest one to scramble up the eggs. 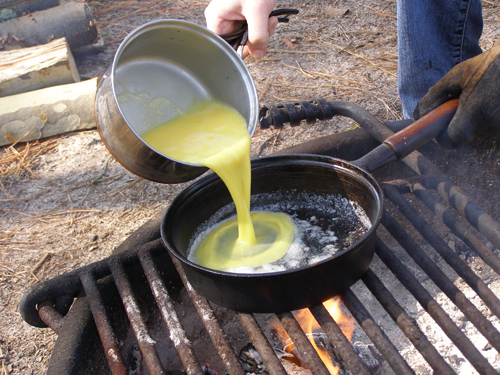 Once the empty skillet is hot, add butter. It should sizzle. When this happens pour the eggs into the skillet. 7. 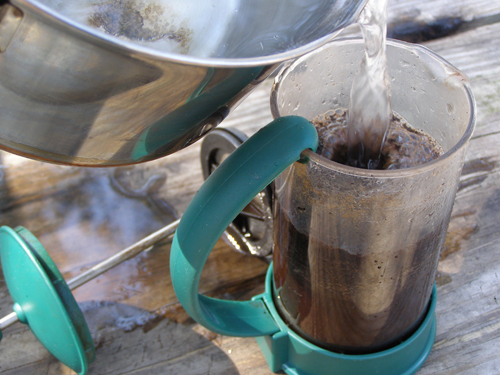 Coffee gets brewed in a small French press - two cups at a time, so it's always hot, fresh and strong. 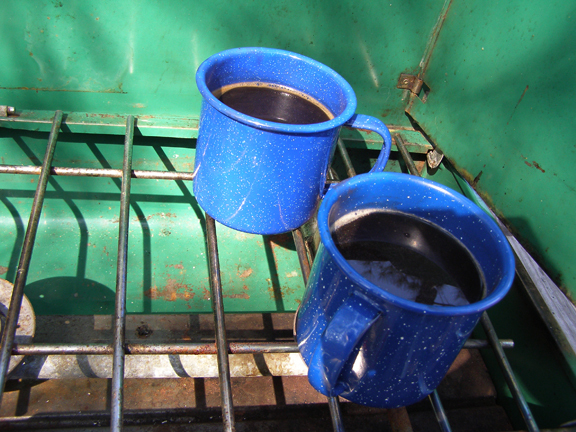 We boil the water on top of a vintage Coleman camp stove. It's been in the family since the early 70's. By the time we're done, we've discarded all food waste into the fire, and all we have left is a few dishes to wash. Weekend off - part one.